A white gravestone in a Canadian war cemetery in northern France is all that remains of Edward Clutesi. The stone — in the Bretteville-sur-Laize Canadian War Cemetery near the city of Caen — bears Clutesi’s name, rank, military service number and age when he was killed in the Second World War. But what it doesn’t show is that the 26-year-old was Indigenous, a residential school survivor, heir to one of his nation’s hereditary chieftainships — and had a brilliant mind. The contributions of fallen Canadian soldiers are quietly remembered every Nov. 11 as The Last Post sounds at Remembrance Day ceremonies nationwide. But the sacrifice of Indigenous soldiers — 3,000 of whom enlisted in the Second World War — is often overshadowed. Today marks National Aboriginal Veterans Day, which was first observed in Winnipeg in 1994 as a way to separately honour Indigenous contributions to Canada’s military service. Stories like Clutesi’s give a glimpse at those Indigenous soldiers killed in action — and what they aspired to be. 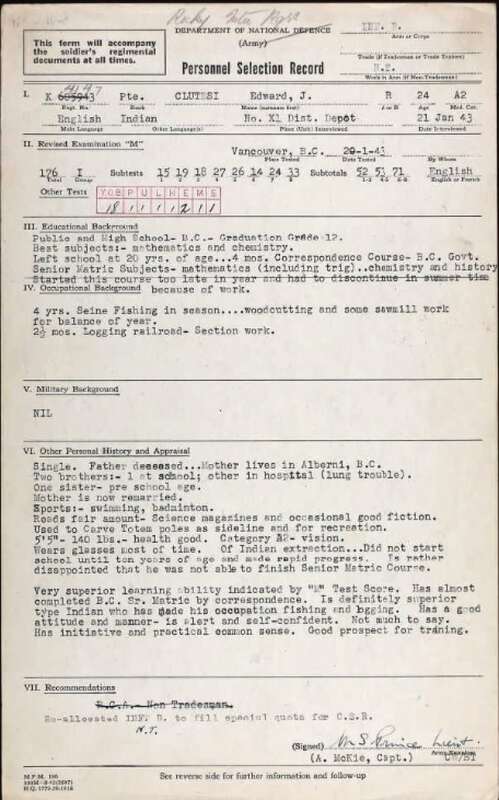 Edward John Clutesi was born on Aug. 12, 1918, one of nine children born to Mabel Yukum and Edward Clutesi, of the Tseshaht First Nation, in Port Alberni, B.C. ​​Tseshaht is one of 14 nations that make up the Nuu-chah-nulth people of western Vancouver Island. Nicknamed “Fish,” Clutesi didn’t attend school until age 10, when he was sent to the Alberni Indian Residential School. “Mom went to residential school and she didn’t like it, so she kept us out for as long as she could,” said Albert. Once in school, Clutesi quickly showed he was highly intelligent, excelling in science and mathematics, with an aptitude for geometry, algebra and trigonometry. Clutesi’s hobbies also hinted at his intelligence: he played the guitar and violin, and liked to sketch, drawing cartoon characters like Mickey Mouse perfectly. “Whatever he did, he was good at it,” Albert said. Clustesi progressed rapidly, graduating from high school at age 20 in 1938. He continued his education afterward, taking a correspondence course in trigonometry. In 1943, a group of Canadian soldiers practising military drills near Tseshaht caught Clutesi’s eye. He joined the Canadian Army soon after. “It was like that saying in America at that time: Uncle Sam wants you,” Albert said. Albert himself was in residential school when Clutesi left for basic training, but he said he had a sense of foreboding for his brother. Clutesi was shipped overseas to Europe, though he wrote his mother often. Albert later noticed something peculiar about one of his brother’s letters. 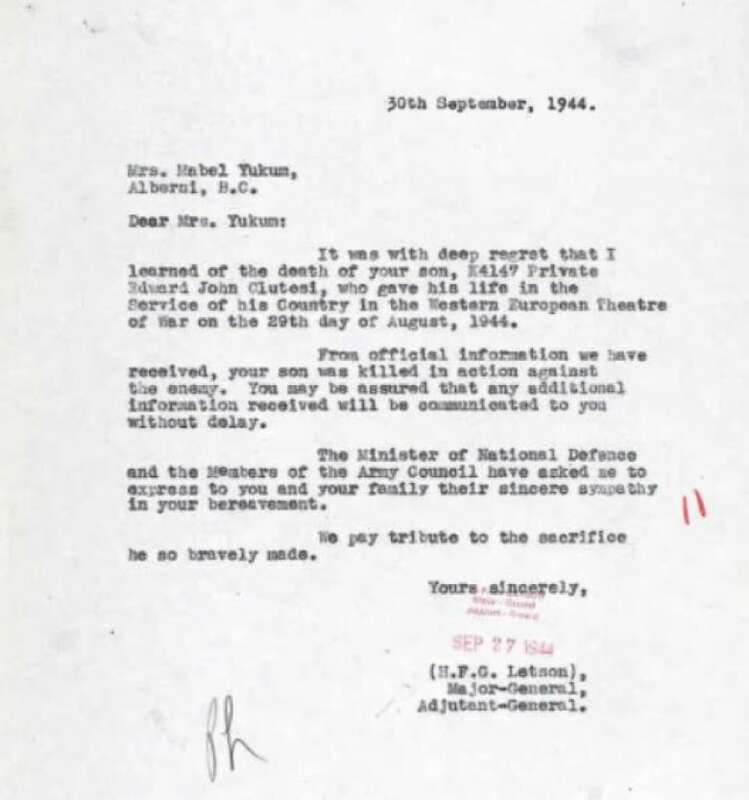 In August 1944, Edward Clutesi was killed in northern France while fighting in the Battle of Normandy and the retaking of Caen, one of Canada’s bloodiest engagements. But the operation also marked the beginning of the end of the Second World War. Today his grave is among the nearly 3,000 Canadian soldiers buried in Bretteville-Sur-Laize Canadian War Cemetery. 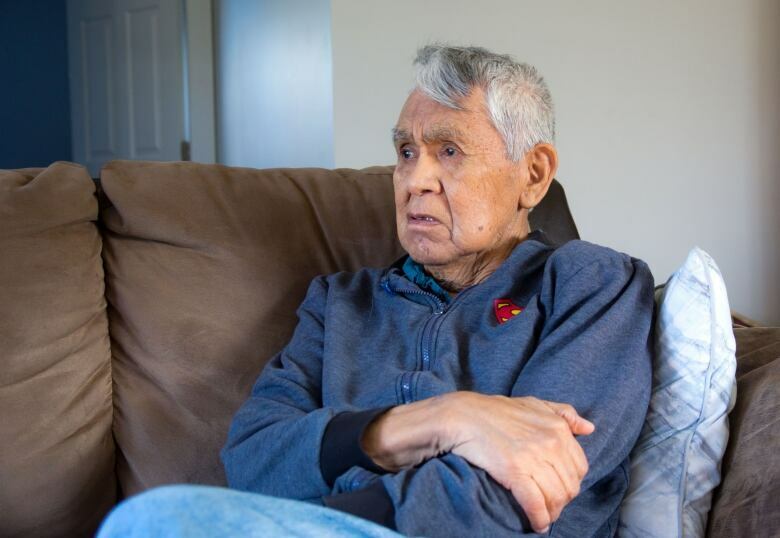 Albert said he knew something was wrong when an army official came to his residential school to ask him where his mother was. She was away, working in Chilliwack, B.C. She knew Edward was dead before being told, Albert recalls. Albert’s daughter, Isobelle, said her father talked about his brother from time to time while she was growing up; she knew that Edward Clutesi was smart, and that he had been killed in the war. Knowing that her uncle was killed in the Second World War inspired Isobelle to join the army cadets when she was a teen. It meant something special to her. “I celebrated Remembrance Day for my uncle. It did something for me as a young person,” she said. Isobelle believes life would have been different had her uncle made it home. “I think it would have really made a difference, growing up in our family, to have some role model in our life,” she said. Clutesi’s academic accomplishments are remarkable because Indigenous people rarely graduated from high school during that time, said Tseshaht Councillor Luke George, an Indigenous advisor at Port Alberni’s North Island College who also served in the Canadian Army for eight years. All the more remarkable, he said, is Clutesi’s brilliance while in residential school. 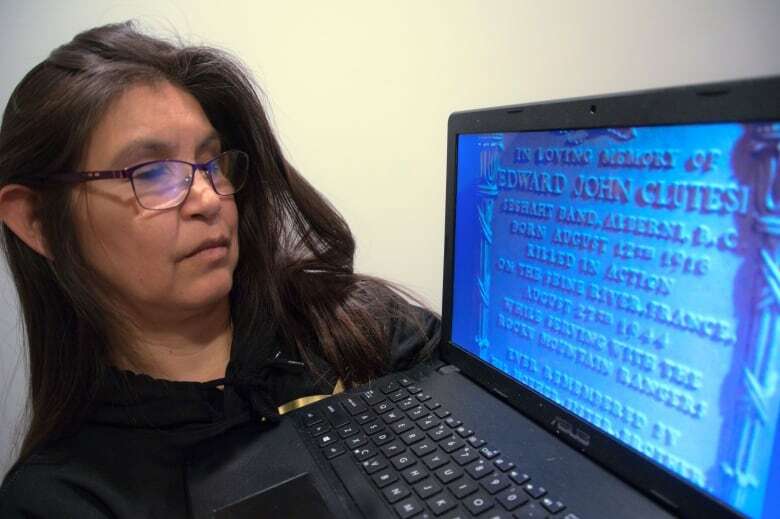 For those Indigenous soldiers who returned from war, life was not easy: Many faced discrimination while also struggling with disenfranchisement, George said.